Here is a hole by hole, 'bird's eye' view of the course. Distances shown may vary slightly as pin and tee positions change. Just click on the images to enlarge them. Hole 1 Par 5 466yds. The first hole at Hartford has the most forgiving fairway. A nice wide landing area sets up a chance of reaching the green in two, as long as the big hitters miss the pond on the right at 260 yards. The further left however, brings into play the large oak near the left side of the green. Played sensibly this is a nice forgiving 470 yard par 5. Hole 2 Par 3 178yds. The second hole is the first of the great par 3's. This hole is 170 yards up hill into the prevailing wind, with a sheltered tee, take plenty of club! Once you get to the green, avoiding the out of bounds down the right, you will find a 60m long 3 tiered monster. Miss it right or left leaves a very difficult chip. Hole 3 Par 5 488yds. The par 5, 500 yard 3rd is Hartford's most difficult hole. Although the views over Northwich and to the Pennines are pleasant, what waits off the tee is not. With out of bounds off the tee down the right, a good tee shot will leave you with a slim chance of taking on the green in two. Be aware if the long valley is in front of you, the woods all down the left, and the two tiered green at the end. If you still have a good card in your hand enjoy the next few holes. Hole 4, Par 4 246yds. The 4th is a short par 4 dog leg left, with water at the back of the green and trouble left and right. 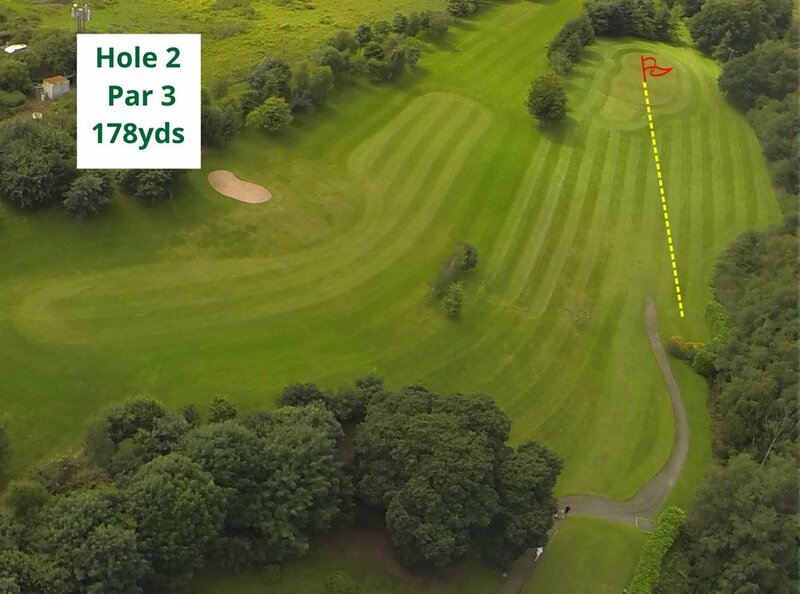 The tee shot is a straight forward if you choose a mid to long iron, to the middle of a large fairway. However, if you feel that at only 250 yards it is worth having a go with a wood (please wait for the bell to ring), a straight shot will make an eagle/birdie very possible. Miss the green and a par will be a good score. Hole 5, Par 3 125yds. The fifth is a lovely short par 3, with water all the way down the left-hand side, and a large undulating green at the end. Off the back tees its 177 yards into the prevailing wind, with water all the way to the green, miss hit this shot and its all 'duck and no dinner'. The 6th is another classic risk and reward hole. AT 259 yards the green is driveable, but be aware of the two large holy trees standing like sentries, and the strategically placed bunkers protecting the small shallow green. Miss the green and you may well be looking at a six! Hole 7, Par 3 187yds. The par 3 187 yard 7th is Hartford's signature hole. The hole has been quoted as 'this hole would not look out of place on any championship course'. likened to Augusta's 6th, the large drop from the tee to the green through woodland to a long green flanked by bunkers and water on both sides, is a pleasure to play. this is one of those tee shots you want to hit ball after ball, and will have you wanting to come back and play it again. Hole 8, Par 4 340yds. The 8th is a forgiving dog left left. Wild tee shots will however, find out of bounds both left and right. A good tee shot will leave you a short iron to the green. Either play short and right of the green to leave a long put or take on the bunkers on the left to close to the pin. Hole 9, Par 4 353yds. The 9th can make or break your score. For the longer hitters there is a clump of gorse, a bunker and out of bounds to the right. To complicate matters there is a stream running down the left and the driving range down the right. Playing short off the tee removes some of the trouble, but leaves a longer shot to a large well protected green with bunkers and water to the left and right. A good hole ought to offer risk and reward, bring all the game you've got, and be prepared to gamble. Make par here and hopefully you would have had an enjoyable round at one of Cheshire's delights. NEW COURSE FLY-OVER - SEE ALL 9 HOLES!